MORE than anything else, Corkâs victory over Mayo in the All-Ireland football final of 1989 was a reward for three years of continuous effort. It began with the memorable victory over Kerry in the Munster final replay in Fitzgerald Stadium two years earlier and was marked by a double defeat to Meath in the finals of 1987 and 1988 â after a controversial draw. En route to the final, Cork created a bit of history - their 1-12 to 1-9 win over Kerry in Killarney earning Billy Morganâs team the distinction of being the first from the county to record a provincial treble. And, an All-Ireland semi-final in which two converted penalties from John Cleary proved crucial in overcoming a seven point deficit from the 15th minute produced a âfirstâ victory over Dublin in the championship. After overcoming Tyrone in the other semi-final, Mayo were contestants after a lapse of 38 years since Sean Flanagan captained to victory for the second successive year. His son Dermot lined out at left corner-back and one of the midfielders was Sean Maher, who at that stage was a St. Finbarrs team-mate of Cork stars Mick Slocum and Dave Barry. The Cork team was captained by Denis Allen, who had made his championship debut in 1972 and lined out with the hurlers in the 1975 campaign (which ended with a first ever defeat by Galway in the All-Ireland semi-final!). As the scoreline indicates, it was a closely-contested game and when it was all over supporters on both sides â but especially Mayo â readily acknowledged that the result could have been very different but for a vital miss by substitute Anthony Finnerty midway through the second half. Cork began promisingly against the wind. Larry Tompkins kicked over a great free from the right sideline after a mere 50 seconds which proved to be their only score from a placed ball over the two halves. He followed with two excellent points before Dave Barry added a fourth, but progress was slow after that, with Mayo winning more ball at midfield. At half-time, Cork did well to be in front, 0-10 to 0-8. Finnerty had been introduced to the attack after full-forward Jimmy Bourke was injured before the break and within three minutes he had the ball in the net to put the Westerners in front for the first time. Predictably, it boosted the Mayo challenge but Cork â battle-hardened after their experience of the three All-Ireland finals against Meath and more powerfully motivated â came charging back. Dave Barry scored an equalising point and John Cleary scored to put Cork back in front before Mayo quickly got back on level terms and then regained the lead. Shortly afterwards came the turning point in the game with Finnertyâs miss from close range. It inspired Cork to produce an all-out effort, rewarded with an equaliser from Paul McGrath in the 56th minute. Substitute Mick McCarthy gave Cork the lead and, under siege for the last ten minutes, they just about held it until the final whistle brought relief â and jubilation after the heartbreak of the previous two years. Scorers for Cork: L. Tompkins 0-4 (0-1 free) J. Cleary, P. McGrath and D. Barry 0-3 each; T. McCarthy and M. McCarthy 0-2 each. Scorers for Mayo: M. Fitzmaurice 0-7 (0-6 frees, 0-1 â45); A. Finnerty 1-0; K. McStay 0-2; W.J. Padden and L. McHale 0-1 each. CORK: J. Kerins; N. Cahalane, S. OâBrien, J. Kerrigan; M. Slocum, C. Counihan, A. Davis; T. McCarthy, S. Fahy; D. Barry, L. Tompkins, B. Coffey; P. McGrath, D. Allen (capt. ), J. Cleary. Subs: J. OâDriscoll for Coffey (44); M. McCarthy for Fahy (53); D. Culloty for Cleary (59). MAYO: G. Irwin; J. Browne (capt. ), P. Forde, D. Flanagan; M. Collins, T.J. Kilgallon, J. Finn; S. Maher, L. McHale; G. Maher, W.J. Padden, D. Durkin; M. Fitzmaurice, J. Bourke, K.McStay. Subs: A. Finnerty for Bourke (33); R. Dempsey for S. Maher (56); B. Kilkelly for G. Maher (65). Photo (Below) - Back row L-R Mick Slocum, Larry Tompkins, Teddy McCarthy, Barry Coffey, Shea Fahy, John Kerins, Conor Counihan, Stephen O'Brien. Front row L-R Paul McGrath, Niall Cahalane, Jimmy Kerrigan, Dinny Allen, Tony Davis, Dave Barry, John Cleary. 1. John Kerins (St Finbarrâs): Took over as goalkeeper from Michael Creedon at the start of the 1984 season and missed just one championship game until his retirement at the end of 1994. A dual Cork minor goalkeeper, he won six Munster medals and two All-Stars, in 1987 and â90 and helped St Finbarrâs to an All-Ireland club title. Kerins, a member of An Garda SÃ­ochÃ¡na, sadly passed away after a battle with cancer in 2001, aged just 39. He will be represented by his son John on Sunday. 2. Niall Cahalane (Castlehaven): A minor and U21 All-Ireland medallist, Cahalane made his debut for the senior team in 1984 and played in almost every position in defence over the course of his career. He won All-Star awards in 1987 and â88 as well as county titles with Castlehaven in 1989, â94 and 2003. In addition, he was a selector on the Haven sides which won the championship in 2012 and â13. Today he is the joint-owner of Cahalane Skuse Auctioneers & Valuers. 3. Stephen OâBrien (Nemo Rangers): The youngest member of the 1989 side, OâBrien had made his debut only the year before but settled into the side quickly. Aside from his success with Cork â which included six Munster titles, two All-Irelands and All-Stars in 1990, â94 and â95, he was also part of an all-conquering Nemo Rangers side, winning six Cork and Munster championships and three All-Irelands. Now runs his own chemical distribution business. 4. Jimmy Kerrigan (Nemo Rangers): Was unfortunate to make his debut in 1978, at just 19, when Kerry were rampant, but soon proved himself to be one of the top defenders in the country and won an All-Star when Cork claimed the Munster title in 1983. Generally a left half-back, he also played occasionally at midfield and was also used by Billy Morgan in the half-forward line but was at left corner-back for 1989. The winner of five All-Ireland club titles with Nemo, he works as an estimator with Kiernan Electrical. 5. Michael Slocum (St Finbarrâs): A panellist in 1987 and â88, Slocum appeared as a sub in the 1989 Munster final win over Kerry and was selected at right half-back for the semi-final against Dublin before retaining his place for the final against Mayo. Was ever-present the following year as back-to-back wins were achieved and received an All-Star award. Currently manager of the St Finbarrâs football team and has also been in charge of the Cork minor team, he works as a courier. 6. Conor Counihan (Aghada): Despite making his debut in the championship in 1981, it was â86 before Counihan managed to hold down a regular spot at centre-back. Once established though, the All-Ireland U21 and junior medallist went from strength to strength and won All-Stars in both of the All-Ireland years. After his retirement, Counihan â who won two county titles with Imokilly â was a selector for both Billy Morgan and Larry Tompkins before becoming Cork manager in 2008. He led the team to three Munster titles, four leagues and the All-Ireland in 2010. Holds the role of CEO of St Josephâs Foundation. 7. Tony Davis (OâDonovan Rossa): The only player to have won All-Ireland medals at senior, junior, U21, minor and club level, Davis made his senior debut as a wing-forward in 1995 but soon settled in defence, equally effective as either a corner-back or wing-back, where he was honoured with an All-Star in 1989. Helped OâDonovan Rossa to All-Ireland club glory in 1993 but retired from intercounty football at the relatively young age of 29 in 1994. Subsequently managed the Cork U21 side and was a regular analyst on The Sunday Game. Works as a Garda crime prevention officer in Anglesea St.
8. Teddy McCarthy (Glanmire): Will always hold a place in GAA history as the first (and so far only) man to win All-Ireland senior medals in the same year. Made his debut for the football side in 1985 after helping Imokilly to county glory in 1984 â he would do so again in â86 â and became a regular, generally at midfield but often at wing-forward too. Won his first All-Ireland with the 1986 hurling triumph and was one of six Cork All-Stars in 1989 as well as being crowned Footballer of the Year. Retired from playing for Cork in 1996 but has since enjoyed plenty of success as a coach to various teams. 9. Shea Fahy (Nemo Rangers): Originally from Kildare, Army officer Fahy moved to Cork when stationed at Collins Barracks and joined Nemo Rangers. He made his debut in red and white against Limerick in 1987 and became an ever-present at midfield, winning All-Stars in 1988 and â90 and also taking the Footballer of the Year award in the latter year. Was a central figure as Nemo Rangers won the 1993 county title and went on to win the All-Ireland club title the following March. Since retiring from the Army, he has worked with IBEC and is now a HR Director with the Musgrave Group. 10. Dave Barry (St Finbarrâs): Barry holds the distinction of holding a League of Ireland medal with Cork City from 1992-93 as well as two All-Irelands. Having missed out on the 1987 season, his reintroduction in 1988 gave the team an extra dimension and he was capable of lining out in either the half-forward or full-forward lines. Another of those to be honoured with an All-Star in 1989, he retired after the 1990 double win to concentrate on soccer. Managed Cork City to an FAI Cup win in 1998. 11. Larry Tompkins (Castlehaven): Like Fahy, Tompkins hailed from Kildare and had played for the county but emigrated to the US in the early 1980s. While there, he became friendly with workmates from Castlehaven and was encouraged to settle in Cork when he moved back to Ireland. The decision reaped benefits for club and county, with Tompkins winning All-Stars as Cork reached the 1987 and â88 finals, and he was similarly honoured in â89. The same year, Castlehaven won the county SFC so he was Cork captain in the double year of 1990. Succeeded Billy Morgan as Cork manager in 1997 and led the county to the â99 final. Runs the famous pub named after him in Cork City. 12. 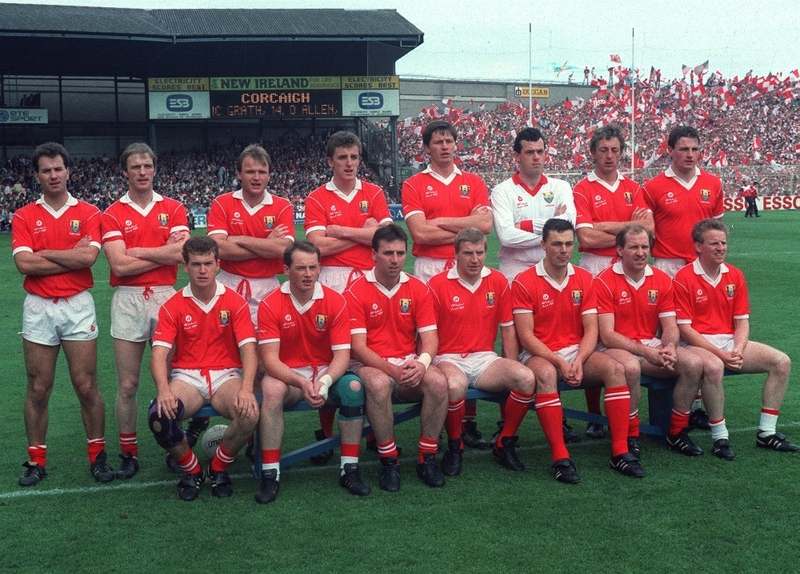 Barry Coffey (Bishopstown): Corkâs successes of the late 80s and early 90s were backboned by the three-in-a-row All-Ireland U21 sides from 1984-96 and Coffey appeared at left half-forward on all three. While he was at number 12 for the â89 final win over Mayo, he had played the rest of the year at left half-back. He again alternated between the two spots for the 1990 campaign, playing at 7 in the final against Meath, though he was back at wing-forward as Cork reached the 1993 All-Ireland final against Derry. Now operates as a self-employed business consultant. 13. Paul McGrath (Bishopstown): Having made his championship debut in the 1988 Munster final win over Kerry, McGrath held his place as Cork reached the All-Ireland final, losing after a replay to Meath. In 1989, he scored in each game and was an automatic All-Star at right corner-forward. The following year, the two-time All-Ireland U21 winner added a second All-Ireland medal and another All-Star. While he missed the 1993 season through injury he returned to the starting line-up in â94, retiring after the All-Ireland semi-final loss to Down. Works with PJ Hegarty & Sons as a civil engineer. 14. Dinny Allen (Nemo Rangers - Captain): While he made his senior debut with the Cork football side at the age of 19 in 1972, Allen missed the â73 All-Ireland win as he was playing soccer with Cork Hibernians, with whom he won the FAI Cup. While he returned to the fold in â75, Kerry were dominant and he wouldnât win a Munster medal until 1983. He also featured for Cork in hurling in â75 but they were beaten by Galway in the All-Ireland semi-final. While he left the Cork football panel after 1985, he was coaxed back for the â88 season and was captain in â89, finally winning that coveted All-Ireland medal at the age aged 37. A winner of an All-Ireland U21 as well, he also helped Nemo to four club All-Irelands and eight Cork titles. A keen golfer, he is now a self-employed financial consultant. 15. John Cleary (Castlehaven): In the 1989 All-Ireland semi-final against Dublin, the game looked to be getting away from Cork in the first half before Cleary converted two penalties to provide a big momentum swing. Having made his debut in 1983, he averaged more than two points a game despite Cork often being in Kerryâs shadow. While he didnât feature in â88 due to injury, he was back for â89 and played at left corner-forward in every game. Though he wasnât a regular starter in 1990, he still played a big role off the bench and remained part of the panel until the end of 1993. Won county titles with Castlehaven in 1989 and â94 before guiding the Cork U21 side the 2009 All-Ireland. Works as an agent for New Ireland Assurance. John OâDriscoll (BÃ©al Ãthan Ghaorthaidh): Starred for Ireland in the 1986 Compromise Rules series in Australia despite having only played two championship games for Cork by then. An All-Ireland U21 winner in â86 as well, he was an important part of the Cork forward division for the rest of the decade though he didnât start either the â89 or â90 finals. He shone during the run to the 1993 All-Ireland final against Derry and remained in the squad until the end of 1997. Works with Bank of Ireland. Michael McCarthy (OâDonovan Rossa): A member of the three-in-a-row U21 sides, the Skibbereen man made his senior debut in 1988. While he didnât start any of the games in 1989, his three points from the bench against Mayo were of huge importance and the following year he scored 1-8 across the four games as Cork retained the Sam Maguire Cup. Having led OâDonovan Rossa to Cork, Munster and All-Ireland glory in 1992/93, he was Cork captain for â93 but unfortunately Derry beat them in the All-Ireland final. Tragically, he died in a road accident in 1998, at the age of just 32. He will be represented by his son Stephen on Sunday. Danny Culloty (Newmarket): Born in San Francisco, Culloty made huge strides on the Gaelic football field after his immigration and won All-Ireland medals at junior and U21 level before he was called up to the senior team. Though he was limited to an appearance off the bench in the â89 final, he was a starter at midfield alongside Fahy in 1990 and captained Cork in both 1991 and â92 after he helped Duhallow to win the county. A selector on the Cork junior football team now, he works for Shreelawn Oil. Michael Maguire (Castlehaven): Suffered from being behind such a top-class goalkeeper in John Kerins, but he showed his worth when filling in in the 1988 All-Ireland semi-final against Monaghan, keeping a clean sheet. After Kerinsâ retirement, Kevin OâDwyer took over in goal but Maguire was first-choice for the 1998 campaign. At club level, the county council employee won county titles with Castlehaven in 1989 and â94. Colm OâNeill (Midleton): Made his senior debut when just 20 in 1984 and won All-Ireland U21 medals in both that year and â85. Was in and out of the side during the 80s and didnât feature in the championship in â89 such was the competition for places, but he was at full-forward in 1990, putting in a virtuoso display in the Munster final against Kerry. He was perhaps harshly sent off in that yearâs final against Meath and retired after the 1991 loss to Kerry. Now lives in Boulder, Colorado, where he runs a chain of pubs. One son, Shane, plays for Colorado Rapids in the MLS and has played for the US soccer team at U20 level, while another, Darragh, has played American football at college level. Niall Creedon (Nemo Rangers): Having been a part of the panel in 1987 and â88, Creedon was selected at full-back for the game against Tipperary but, though Cork only conceded six points, he didnât feature again in the red shirt. Helped Nemo to three county titles as well as All-Ireland club championship wins in 1988 and â94. He now works for MSD in Brinny. Tony Nation (Nemo Rangers): Like Tony Davis, Nation first appeared as a half-forward, in 1984, but soon found a home closer to goal. Captained Cork in 1988 following Nemoâs county win in â87, but the Munster semi-final win over Tipperary was the only game he played in â89. A winner of four county titles with Nemo and three All-Irelands, he started at corner-back for the 1990 All-Ireland final and retired in 1992. Works as a maintenance manager at Whitegate Refinery. Eoin OâMahony (Clonakilty): He made his debut for Cork in 1982 â having won an All-Ireland minor medal the previous year â and won a Munster championship medal at centre-forward in â83. While he featured in 1984, his next appearance would not be until the Tipperary game in â89, when he scored a point. This was only time that the retired Garda played during the campaign. Denis Walsh (St Catherineâs): The dual star made his Cork football debut in 1986, having won All-Ireland U21 medals in 1985 and â86. He also featured on the successful Imokilly sides of â84 and â86. In â89, he played at full-back in the Munster final win over Kerry and was also part of the panel in the 1990 campaign. Later managed Waterford footballers and was appointed as Cork hurling manager in 2009, taking the county to a Munster final, where they lost a replay to Waterford after extra time, and an All-Ireland semi-final. Is employed by New Ireland Assurance. Michael Burns (Castlehaven): A sub on the successful 1980 All-Ireland U21-winning side, he was at centre-back as the title was retained the following year. He scored two points from midfield in his senior debut, the drawn Munster final against Kerry in 1982, and also lined out at centre-forward for the county Was recalled in 1988 after a few years off the panel and appeared as sub against Tipp in â89. Works with eircom. Colman Corrigan (Macroom): While he didnât feature at all in the championship, Corrigan would surely have been part of the Cork defence but for an injury sustained in the league final against New York. Also part of the 1980 and â81 U21 sides, he had received All-Stars for his performances during 1987 and â88. Now working in the Department of Social Protection, he was also part of the panel in 1990.